While out looking for fir cones in the forest one morning, little Megumi meets a bear. They quickly become close friends, dancing and playing together every day. 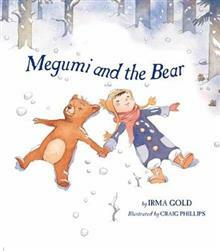 Then one afternoon the bear doesn't appear, and although Megumi goes out day after day to wait for him, still he doesn... read full description below. Friendship is sweet - and sometimes when you let go of a wish it may unexpectedly be granted. While out looking for fir cones in the forest one morning, little Megumi meets a bear. They quickly become close friends, dancing and playing together every day. Then one afternoon the bear doesn't appear, and although Megumi goes out day after day to wait for him, still he doesn't come. Megumi is distraught! Finally, finally, finally, she stops wishing to meet the bear again and begins to forget about their happy friendship - and then...guess who unexpectedly turns up again? Features: a touching portrayal of the joy of friendship; endearing art with wide commercial appeal; and a gentle lesson in how patience can be richly rewarded. Irma Gold is an award-winning writer and editor whose work has been widely published in Australia. Her debut short-fiction collection won both a national award and widespread critical acclaim. Irma was formerly based in England and now lives in Canberra, Australia, with her husband and three children. Craig Phillips (not the Liverpudlian builder who in 2000 won the first Big Brother) is a freelance illustrator who has created poster art for numerous high-profile rock groups, including The Hives and The Foo Fighters. His work has featured prominently in numerous rock-art publications, while Megumi and the Bear is the first title he has illustrated for Walker. He lives in New Zealand.